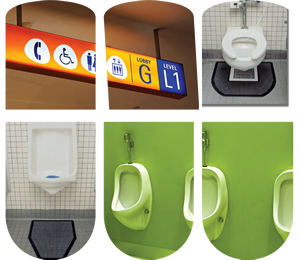 Sani Mat disposable floor mats (urinal and commode) offer multiple solutions in the restroom. Wet floors caused by splashes around the urinals and commodes are unsightly, unsafe, unsanitary and a constant source of odors. Inner super absorbent Trilex(TM) 20 fibers catches drips and splashes, with every square inch absorbing more than 3ml of liquid. The Kleen N' Fresh (TM) scent fights odors and helps keep restroom floors safe and sanitary. Poly Stay(TM) bottom layer keeps the mat from slipping. It cannot be kicked or accidentally moved out of place.